Are you looking for good speakers? Well, let’s be frank with you that there are several options for a pick. Your needs may be unique but there are multiple models to meet those. In recent times, we have tested more than dozens of speakers and honestly speaking; only a few can be deemed innovative in design and function. For this blog, we have distilled only two from a wealth of options – XB30 and JBL Charge 3 – for comparison. We’re focused on only designs and performance. We never allow ourselves to get bowled by the big names in the Industry. Therefore, you can trust us for an unbiased discussion and verdict in this regard. The look is important and we know it well. The Sony model looks appealing with rubberized finishing and scratch-resistant texture. Its corners are heavily rounded. The tapered enclosure has contributed to its overall sleek and modern look. Pick it up and you will feel that it’s not a lightweight device. The frame feels solid. Obviously, it is not as hard as a brick but definitely strong enough to withstand daily use and abuse. Sony claims it is water resistant. Drop it from a moderate height and you will find no scratches. That is a great peace of mind for the careless users. There are currently four options in the color palette. Choose from red, black, blue and white. An LED light travels around the speaker grill and that is the striking feature of its great look. JBL Charge 3 is a big and tough waterproof model. ‘Resistance to water’ is a big feature of the speaker. The IPX7-rated speaker can be submerged into water (up to 1meter in depth) for half an hour. It can survive even in a pool but must not be left there for an extended length of time. From its basic introduction, we can say this model is highly durable. Sony has made some remarkable improvement in XB30 if compared with XB20, which is a cheaper version. Quality of sound is loud, precise and highly controlled. Even in a big room, the sound coming out from XB30 feels great. No distortion in sound and that is what we liked most about its performance. Just imagine a speaker fills the entire room with its smooth midrange and razor-sharp sound. We would love to mention its low end and do think it is the USP about this Sony speaker. The model features a bass button on its top and you can easily flip it to activate an additional EQ in order to increase the low end. The sound comes clear in the standard mode. You can change the sound to get a much more pronounced version by just hitting a single button. JBL Charge 3 won’t let you down if it comes to quality of sound. Its sound is as impressive as its physical size and design. The speakers will fill up a large room. You will be able to listen to the great sound from far but for best quality; you need to be within 20 feet. It produces very powerful, impressive and deepest bass. The bass response is finest on a flat surface as it contributes to sound resonation. The speaker can be propped vertically though, from our experience, we can tell that it would hamper sound quality. Therefore, horizontal orientation is best to enjoy the most melodious experience. No distortion was experienced even on a high note! That will work great at a party when you all love to dance to loud sound. You will be overwhelmingly impressed with both quaintly and quality of the bass offered. However, there is a catch! If you listen to music played on the high-frequency instruments like violin, the sound is not detailed. It could be a big disappointment for those who are always in love with some big players like Bose. Still, most music lovers will find no strong reason to write it off. The Charge 3 integrates a built-in mic that can be used as a speakerphone whenever required for conference calls. The sound through the mic comes quite clear and we bet that none of your friends will understand that you are speaking to them via a speaker. There is little doubt that Sony has made great effort to ensure perfection in every aspect. According to our opinion, extended battery life is the biggest upgrade made by the tech don. It gives 24 hours’ life to the speakers when played at 3/4th of its capacity (in terms of volume). Don’t find that much sound satisfactory? Well, let us assure all that you rarely need more than that. Control is another great feature of this Sony speaker. What the most manufacturers do with sleek speakers is they go for simplified control system involving only a couple of buttons to control literally everything. Sony has not followed the popular blueprint and instead, has integrated a dedicated button for every prime feature without making things complicated. You can also control the speaker by using Sony’s free app. With that, you will get a few additional options. The starters can easily control the light show with the options in front of the device. With this app, several Sony XB speakers can be paired up together. 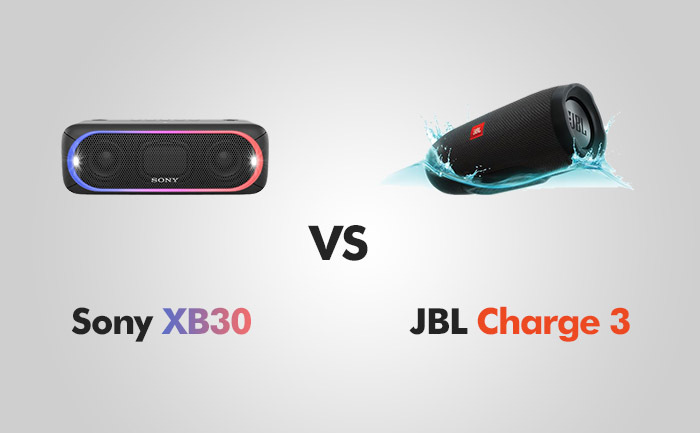 As far battery life is concerned, JBL Charge 3 lags behind its Sony competitor. It offers battery life for 20 hours. That is not a disappointment though. There are separate buttons for power, volume control, play/pause/skip and Bluetooth Pairing. A unique JBL Connect button allows the users to connect several JBL Connect speakers to the augment sound, implying both speakers will produce mono sound. The speaker also houses dual external passive radiators. The radiators will vibrate when you play heavy-bass tracks and that vibration is clearly visible. PROS: Bass is great even without the extra bass turned on / NFC / Great Battery Life / Sturdy / Water resistant. PROS: Volume level / Good battery life / IPX7 waterproof certification / Can be used as power bank / 3.5 mm input / LED battery indicators. CONS: Can’t listen wirelessly while charging / Not waterproof / Proprietary charger. CONS: Lacks a bit in mids and highs. We’ll definitely caste our vote for the Sony model. It looks more striking than its rival JBL Charge 3 and offers battery life for 4 hours more. If overall performance and quality of sound are taken into consideration, Sony XB30 is ahead of – though not much – JBL Charge 3.